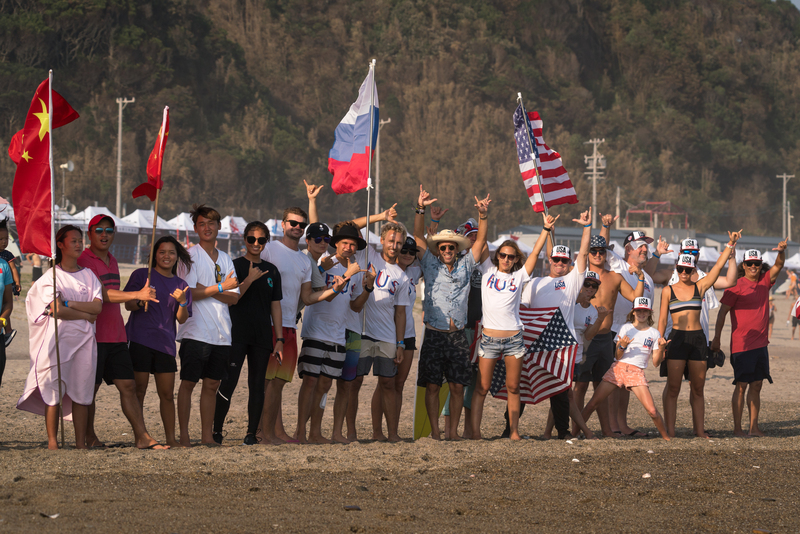 Fernando Aguerre was re-elected unopposed today as President of the International Surfing Association (ISA) at the ISA Annual General Meeting (AGM) during the 2018 UR ISA World Surfing Games in Tahara, Japan. Aguerre, whose tenure at the ISA is highlighted by Surfing’s inclusion in the Tokyo 2020 Olympic Games, will commence his 9th term as President since being first elected in 1994. “My first words are ones of gratitude to the ISA Members for the continued confidence and support of me on this amazing ride,” said President Aguerre. “I am as passionate for Surfing and the ISA as I was when I first started. I am honored to be able to continue to lead this organization and to dedicate my time and efforts to this worthy cause as we look ahead to a bright future. “The sport of Surfing and the ISA have come so far since I first took on this challenge and commitment. We have taken the sport to places that we never thought imaginable, all the way to the Olympic Games. But we also seen huge growth in the ISA, bringing Surfing to new corners of the globe, to non-traditional Surfing nations, giving children hope and a dream that they had never fathomed. “As one man, I am nothing, but with the great work of friends and supporters from around the world, we have been able to grow and develop Surfing as a true force for a better world. In addition to the reelection of Aguerre, Barbara Kendall of New Zealand and Casper Steinfath of Denmark were also re-elected as ISA Vice Presidents, both commencing their second terms and reaffirming the value of these respected international leaders inside the ISA. Kendall, an Olympic Gold Medalist and three-time Olympian in windsurfing, is also a former IOC Member and current chair of the Association of National Olympic Committees (ANOC) Athletes Commission. Steinfath, a 4-time ISA World Champion in StandUp Paddle Racing and current professional athlete, is also member of the ISA Athletes Commission and a leading advocate for athletes in the global SUP community. A moment of silence was taken at the end of the AGM in remembrance of Mike Lee, the Chairman of Vero Communications who played a key role in the inclusion of Surfing in the Tokyo 2020 Olympic Games. The ISA AGM also passed sweeping reforms to the ISA Constitution creating a more modern, document in line with contemporary standards of good governance in the Olympic Movement. In addition to key revisions on transparency, integrity and institutional athlete involvement, the Executive Committee was expanded to include two new positions for regular members as well as including the Chair of the Athletes’ Commission, currently Justine Dupont of France. In doing so, the AGM increased the size of the EC from 5 to 8 and confirmed women make up nearly 40 percent of the ISA executive body, well above the IOC-mandated standard. For the two new positions on the EC, the AGM elected Jean-Luc Arassus of France, President of the French Surfing Federation, and Atsushi Sakai of Japan, President of the Nippon Surfing Association, two accomplished leaders in the ISA’s medium and long-term ambitions for Olympic Surfing. Addition, definition and terms of reference of the ISA Athletes’ Commission including provision for the election of athletes by their peers at the World Surfing Games starting in 2021. The 2018 UR ISA World Surfing Games is taking place from September 15-22 in Tahara, Japan. For news, results, photos, and live streaming, visit www.isasurf.org.